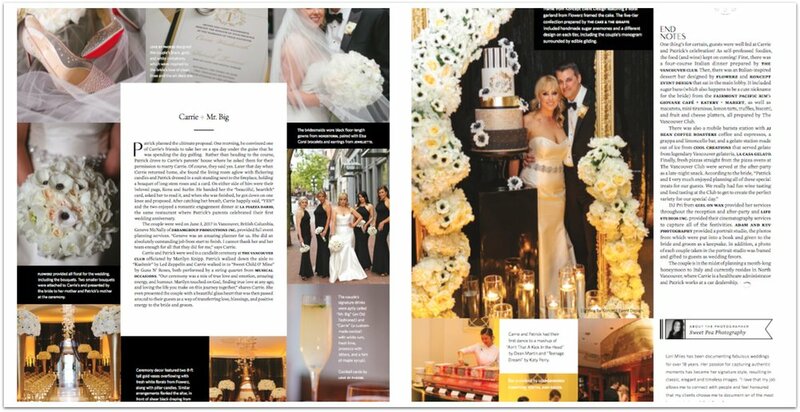 It is so fun after many accessory visits to see a brides Bridal Style Vision come to life and be featured in the pages of Wedluxe Magazine! Carrie had already chosen a beautiful Romona Kaveza Gown with clean lines and gorgeous sparkling belt so as soon as we saw the photos she brought we knew we had the perfect earrings to go with! Voila! The Kara Earrings! A bridal belt is kind of what we like to call a "Necklace for the waist" so opting for a bit of a longer earring to go with it eliminates the need for a necklace and creates an overall balanced look! This is such sweet moment of her sister helping her put the jewels on, especially because we also did her sisters wedding jewellery about seven years ago! If you are wondering why all her girls look so fabulous...it is not just because her other sister owns a fabulous beauty parlor called The Glamoury that we have blogged about before! ...it's because they got it from their mama! No boring Mother of The Bride outfits here! We love this sparkly ensemble complete with our Three Marquise Post Earrings and darling Hair Pins from Jeweliette Jewellery! ...to the fabulous Cake and The Giraffe cake and incredible decor from Koncept Events! Along with the oodles of inspirational beauty pins you have been collecting, you will want to bring your bridal accessories to your hair trial. Why you ask? Because having the items to work with at the trial allows your stylist to create a style that truly shows off the piece and finishes off your final look. You don't want her (or him!) spending hours designing a hairstyle only to be surprised on the day of with a new element, do you? Having the piece in hand is key to determining the best possible placement for maximum impact. Heck, you didn't spend all this time and money picking out the perfect piece only to have it not show up in photos! When it comes to side combs, we usually recommend that they be placed on the RIGHT side of the hairstyle, as this is the side that your guests will see the most of during the ceremony and be in most of the photos. However, some stylists we know like styling the hair to the LEFT side of the face because they say they say the hair just looks better on that side. See? That's one of the details you can determine at the trial and you will need the accessory to decide for yourself which way you feel the most beautiful! We know sometimes it can be hard to choose a piece and often we see brides torn between two styles in our shop that they really love. So as an extra service to our brides who have committed to purchasing with us, we offer them to take two pieces to their trial to ease their selection process. Appointments are not necessary, but you are welcome to make one so we know to reserve that time for you! Love the Sarah Halo featured in the post? It is available in our online shop! 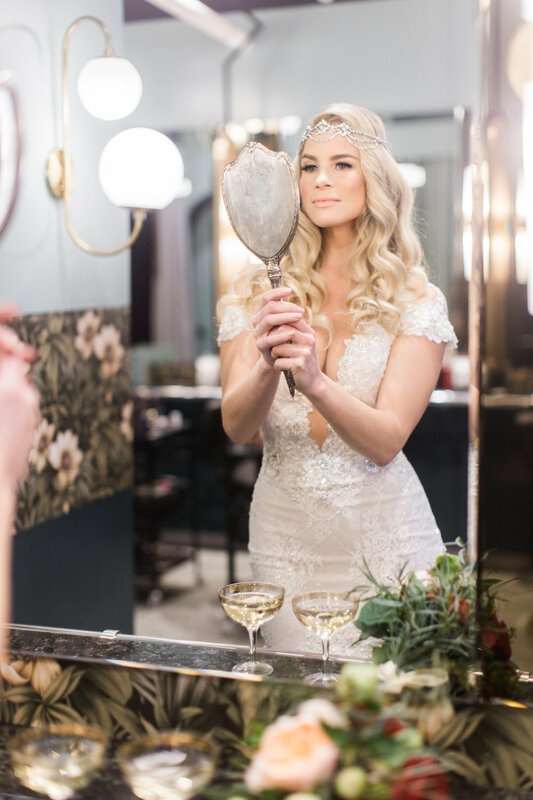 Brides, you are going to want to get pinning once you see these soft, feminine details from our latest Style Shoot inspired by lilacs recently featured in Rocky Mountain Bride. Our new Kara Earring with a Vintage Rose Swarovski Crystal center was a perfect match paired with a blush Lazaro gown from Bisou Bridal. Although the shoot was originally planned to take place in a Buttercup Field, the yellow and purple combination worked out perfectly! Not only are they opposite but complimentary colors on the color wheel, this paring will also satisfy your inner Laker fan! To add this to your collection, visit our Sample Sale page to purchase this item.